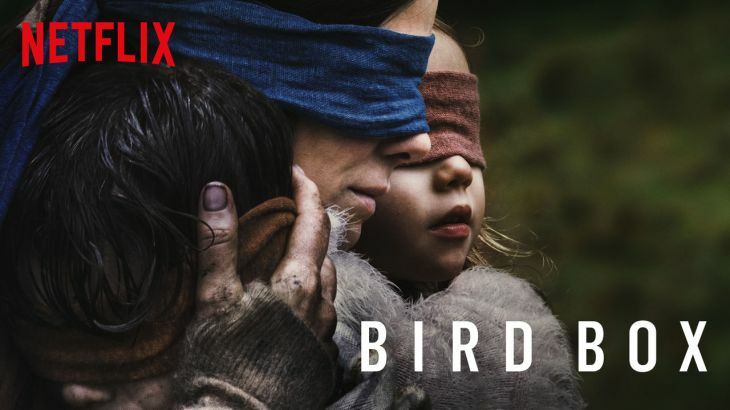 Bird Box, a new Netflix film, has had many people on the edge of their seats due to its suspenseful and innovate storyline. The movie is being talked about on all social media platforms with Screen Rant’s Sandy Schaefer calling it “a respectably moody and intelligent psychological thriller, if also a relatively muddled supernatural horror allegory.” Many people are interested in this movie because they say it’s scary and suspenseful, and people can’t stop watching it. The movie explores a scenario where characters in a post-apocalyptic world are blindfolded and ordered to not remove their blindfolds outside or they will be exposed to their biggest fear. They must stay indoors and fight for themselves in order to stay alive. The consequences for removing the blindfold can be devastating. Surprisingly, many people are also doing “challenges” where they are blindfolded and try to complete daily challenges while they can’t see. This has compelled Netflix to issue a warning to not try anything similar to the movie at home. All in all, Bird Box is a thrilling watch if you want something exciting and suspenseful. Just don’t become one of those people that “blindly” follows the crowd and attempts one of the dangerous challenges!